I have much in my life right now that needs tending, and I have found myself spending quite a bit of time lately thinking about time. I began to admit the undeniable fact that I was falling behind, and I sought God concerning this issue. For a long time I would only pray that God would remove some of the stresses in my life. When He showed no haste in removing the pressures, however, I was forced to consider the fact that I might just need some time management skills. Sadly, I had already tried several time management techniques before and failed at every attempt. I knew that there was a lesson for me somewhere in all of this, and I was eager to find out what it was that God wanted to teach me. Here’s what I learned: Forget for just a moment what the modern world has taught us about time management. It is not a tool to bring us personal achievement, personal satisfaction, and personal glory; nor is time management a gimmick—simply another way for us to ensure that we get everything that we want out of this life. It is, rather, a way of life. Time management (the kind that pleases God) begins with a heart of humility. The first step to good time management is the setting of priorities. A humble heart is able to prioritize the needs of others. It is only the humble of heart that are able to rely on God to meet their own needs while they strive to meet the needs of others. With humility and through the Holy Spirit they are able to be patient, faithful, kind, joyful, and peaceful through even the most difficult and thankless service or chore. And, it is only the humble heart that can choose wisely the tasks which are the priorities of God, and not the world. A saying comes to mind which I somehow managed to tuck away (without recalling the author): There’s always enough time to do the will of God. I still struggle with the problem of time management, but in God’s Word I have found the answer, and the means by which I can begin to be transformed, rather than conform to the world’s idea of work, pleasure, and priorities. 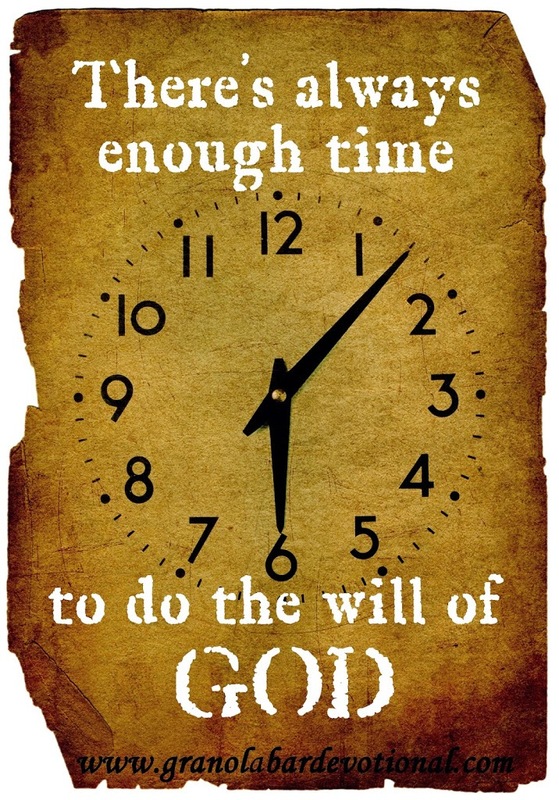 I find that there is more than enough time to do God’s will, but it requires humility and a willingness to sacrifice my will for His. Although it’s not always an easy road, I know that it is the right road. I love this devotion. Your conclusion is exactly where God has led me. I just finished a 20 part series on my blog about balance. And your devotion is pretty much my conclusion.